Menopause and breast pain often come hand in hand, and this is due to a number of reasons, including hormonal imbalances, medications, and lifestyle. Although breast pain can affect women of any age, it is particularly prevalent in women who are going through menopause. The time when the pain is usually felt is the perimenopause stage. Fortunately, most find that the pain dissipates after menopause. Read on to discover more about the relationship between menopause and breast pain. Menopause and breast pain are thought to be mainly linked through hormonal imbalances. During perimenopause, estrogen and progesterone levels are erratic, and they also happen to be the hormones that have a huge effect on the breast tissue. Therefore, when levels of these hormones fluctuate, there is sometimes an inflammation or soreness in the breast area. Production eventually ceases completely, and this is when women will experience a decline in breast pain. Hormonal imbalances account for around 75% of all breast pain, and so this is most likely the main reason menopause and breast pain are linked. 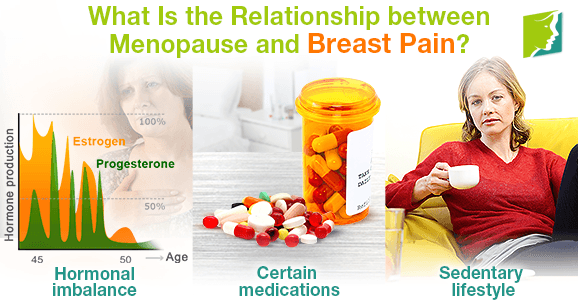 Another leading cause is certain medications; pills for heart and psychological conditions have been known to be a contributing factor to breast tenderness and discomfort, and the likelihood of getting some of these illnesses increases during the age menopause normally occurs. Between the ages of 45 and 55 is when perimenopause normally starts, and this age is also a risk factor for cardiovascular disease and depression. This means that the breast pain these women are feeling could be more to do with the side effects of medications than menopause itself. As women get older, their lifestyles normally become more sedentary, and lack of exercise plays a large role in the onset of breast pain. This is mainly due to the fact that physical activity helps stabilize blood sugar levels, and if these are not in balance, breasts can become inflamed or swollen. A sedentary lifestyle at any age poses a threat to breast comfort, but is more prevalent in menopausal women. Therefore, the relationship between menopause and breast pain can sometimes be blamed on lifestyle factors, which are fortunately very treatable. Menopause and breast pain often come hand in hand, the relationship between breast pain and menopause is not entirely straightforward, and there are often a variety of factors that work together. In order to counteract the effects of menopause on the breasts, a change in lifestyle habits is often considered the cheapest, healthiest, and safest route to choose, eat healthy and exercise regularly. To work out what is right for you, read more about treating breast pain. Excessive alcohol and stress are some causes of sudden breast pain. It's crucial to be aware of your lifestyle and diet to pinpoint possible triggers.